- Phone and watch battery are correct, despite it saying theyre the same in the app. 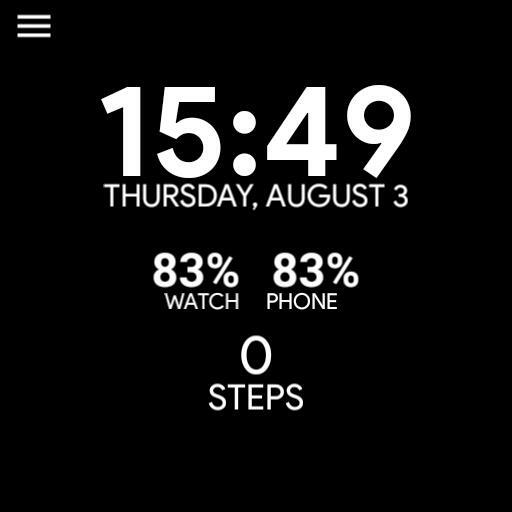 On your watch, it will show the right percentages. - As of 2.0.0beta6 you can no longer enable AM and PM in 24hr mode. This was intentional and not a bug because it would be pointless having AM and PM showing when the clock is set to show 24hr time. 1.6.5 - Changed what the Android Wear logo does. You can now tap android to go back a colour and you tap wear to go forward a colour. I did this because the colour switcher caused crashes after applying on some devices. 2.0.0beta1 - Added pages. You can tap the page number in the bottom right to switch page. 2.0.0beta2 - Removed lots of useless code. - Fixed bug where you cant see the custom colour on the 2nd page. - Moved the clock in the settings page to the centre. - Hopefully this will be the last update before the official release - there has been way too many betas. 2.0.0 - Brand new settings page with toggles for time, date and many other options. You can toggle these options straight from the watch face so you do not have to go into the app. Just tap the cog in the corner to access the options page and tap the back icon to return to the watch face. All changes are saved automatically. 2.0.3 - Moved the word OPTIONS slightly to the right. Update to this version if part of the O is cut off on your screen. - Material Design can be enabled from the OPTIONS if you wish and the new icons will be used and they will be in new place, the top left. 2.2.0 - Material is now the default design. It can still be disabled in the OPTIONS. 2.2.1 - Fixed an issue whereby the new Material icons would not abide by the colour set by ucolor. 2.3.0 - Many of the tap actions for the OPTIONS have been disabled on the 1st page, preventing accidental taps. 2.3.5 All options have been disabled on the 1st page, and actions on the 1st have been disabled on the 2nd, fully removing accidental changes. 2.4.1 - Darkened the background of the confirmation dialogs. - Added a timer so the dialog auto closes after 10s or when you hit YES to open an app. - The old design will be removed in version 2.5.0, so if you still use it, save a copy of this version.